My mom makes THE BEST homemade refried beans! I love Mexican food, so this would definitely be one of my favorite dinners! You can use these beans for anything! Burritos, chimichungas, bean dip or as a great side to your mexican meal! My mom has been making these beans since I was little. Ever since, I haven’t been able to eat canned refried beans, that’s how good they are! These will be the best refried beans you ever eat! You will never eat canned beans again after trying this recipe! Put dry pinto beans into slow cooker. Fill crock-pot nearly to the top with water, about ¾ of the way full. Crush chicken bouillon cubes over the top of water, sprinkling evenly. Next, sprinkle garlic salt evenly over top. Drop the half medium sweet onion into slow cooker. Strain beans or pour off juice, saving the juice in a separate bowl. Add ½ cup of butter and a small amount of juice that beans cooked in. Use a hand blender to mash beans. Add juice and blend to obtain desired consistency. You want to leave beans a little runny as they will set up quite fast. I'm glad you found my blog so that I could find yours! 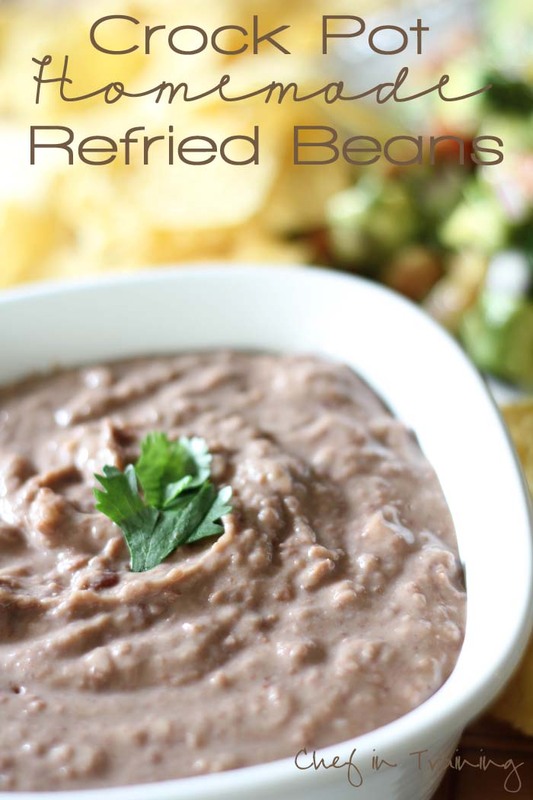 I love refried beans and this looks so easy to make. Thanks! That's how I am with enchilada sauce. Every canned variety disgusts me because my mom made ours. Now I make it, too! How much is a "cube" of butter? Is that a stick of butter or 1 cup of butter? @easternjourney.com It is one stick (1/2 cup) of butter. I will fix that in the recipe. Sorry about that confusion! You say"cook on high till beans are soft" what kind of time are we talking about? Could I start this and leave for work or is this a stay home kinda of day? I cook on low for about 8-10 hours. Its good to check on them periodically to makes sure there is still enough water in them and that they are getting soft and not too overcooked. Made these this past week! Fabulous!! Will never want canned beans again! We stirred in a can of green chiles at the very end, so good my kids each ate 3 helpings! how long do these take to cook, roughly? do you need to soak the bean first? Can you substitute lard for butter? My husband is mexican and I want to make refried beans, but his family always uses lard and I know he will want them to taste the same! Thanks. Anonymous, I cook mine on high for about five hours, but it would depend on your crock pot. Mine gets the beans to a slow boil. And you *can* sub lard for butter, but it won't be as salty (I assume CiT uses salted butter in this recipe) so taste first. Lard has a more "greasy" mouthfeel on the tongue, too, so you might want to start with just half as much. What do you do with the onion? Is it mixed up with the beans? So you slice it when you put it in or just a half onion intact? Probably a dumb question! What do you do with the onion? Does it go in the blender with the beans? Made these to go with our dinner tonight. So scrumptious!! Thanks for the recipe!! hello, this is amazing recipe I will make them ASAP , just wondering how long do they last in the fridge..??!!! being Mexican I was told that when you add on ingredients ,usually the go bad a lot faster then when they are just plain cooked beans ..I really want to make this beans but in a bigger quantity..
thank you so much, I also would be making those delicious cheese enchilada stack ...you are wonderful...again Thank you ...!! Do you use a whole batch before they go bad? Can these be frozen? My daughter loves rice and beans and I would love to make my own. Who knew it was this simple! Do you use dried pinto or canned beans? Just wondering! Ill admit, I was skeptical. How much of a difference is there really between this and a can. HUGE difference! These are the best refried beans I have ever tasted. Will never go back to canned. Thank you for the recipe! Do you soak the pinto beans before putting them in the crockpot? Can these be made low-fat by using less butter - or does the butter give it a needed flavor? Definitely! Both my mom and I sometimes make it without the butter for fat-free beans. Granted, butter makes everything better ;-) but I have cut it out and it still tastes fine! This recipe sounds wonderful. Can you tell me approximately how long these need to cook? Would this work equally well with black beans? Is there any way to preserve these after you've made a big batch? Would they freeze well? I've been looking for a good, easy refried beans recipe. Also, do you ever cheat and use canned pinto beans in a hurry? Just made these refried beans!!! OMG11 They are SOOOOO good! Found you on Pinterest! Anyway...thank you! These are A-Mazing!! SO GOOOOOD!!! t made these to go with your (hubby approved, no less!) chile colorado burritos. I'm making those tomorrow (had to do the beans today, since I only have one crockpot) & I can't wait to try the burritos! I just hope they turn out as pretty as yours. :) Found you on Pinterest, and have already pinned several of your recipes. I LOVE your blog!! I LOVE refried beans! Thank you so much for posting this. If I did not have baked beans cooking in my crockpot right now I would be making this now. Can't wait to try it! Ok I want to make these to go with the Smothered Chile Colorado Burritos, but I only have one crockpot. So what can I make first? Thanks in advance! Im super excited to try these. My family loves refried beans. Couple questions: can you use any other type of beans. Can these be frozen? These are amazing! I will never buy canned again. I can't get this recipe to print like many of your others do though. hey with the beans, do you just end up blending the onion in? or do you just throw away. after crock potting?? How well do these freeze? How would you re-heat them? I'm wanting to make a big batch and freeze to use later... Thanks!!! I don't know how well these freeze because I never have. I keep them in my fridge for a week, but we eat them all usually before then. If you do try to freeze them and reheat them, please let me know how that goes. It would be good to know because it would be nice to always have these on hand! Have a great day, sorry I am not much help on this! These sound amazing! I'm making enchiladas for dinner, and really wanted these beans, so I'm using the quick method on the stove, and I just added all of the ingredients in your recipe. Hope it comes out ok, fingers crossed!! I froze them last time i made them and they taste the same! I did some in a sandwich size bag and some in a gallon (half way full) and they taste great! My husband even asked " did youmake more of these?" He was surprised at how "fresh" they tasted and they've been in the freezer for over a month! CiT... You can freeze refried beans for about 4 months or so. When I unthaw them I either put them in the fridge for a couple of days or just throw them in a pan on the stove on low heat so they don't burn and stiring often as they defrost. I wanted to ask about the onion also! Do you mix it in or discard? You discard it after beans have fully cooked :) Let me know if you have any more questions. Have a great day! I was wondering if these could be frozen for other meals nights instead of making every time. My husband is a huge fan of refried beans but i work 9\7 am to 5 pm everyday and don't have a way to be home and watch the cook and stir them but we do taco nights on Thursdays. so i thought i could make a bunch an freeze and reheat. I was really skeptical that these would turn out well. It just looked too simple. Throw it all in a crock pot, put in very few ingredients and it would be good? I assumed the beans would be bland. BUT BOY WAS I WRONG! It is that simple to make and it IS as good as everyone is raving. I couldn't believe it. I'm eager to try it with black beans - I love black beans! Thanks for sharing such an awesome recipe. So sorry that I doubted you. Know it's been a while, but did you ever do black beans? How did they turn out? Thanks! Delicious recipe! I made it today and could have eaten it by the bowlful. Thank you! I know it says to cook until beans are soft, but does anyone have a approximate amount of time that they will need to cook? I have made these for my family several times and now they won't even let me buy cans of beans anymore! Thanks so much for sharing this recipe. About how long did it take to cook? Would this be something that could cook overnight? I really had my doubts about these beans--the recipe just seemed too easy to be THAT great. But I had a bunch of dried beans to use up, so I gave it a shot. They are sooooo good! I just can't believe something so simple could be so flavorful. I'll never buy canned beans again! I saw several question asking if these can be frozen.....Heck yes they can! :) I have made these beans 3 times and I always freeze some. I portion out the leftovers into quart size zip locks so that when I have a recipe that calls for beans I just pull them out of the freezer and they defrost on the countertop in about an hour. Nikki you have ruined me for any other refried beans, because these are delicious and sooooo easy to make! These look awesome but butter is misspelled. Just made these tonight and my kids gobbled them up. I have been looking for a good and easy recipe for retried beans for years. This is going to be a regular in our household. Thank you so much for sharing! These are so delicious!! This is why I love pinterest, woulda never come across this otherwise! How many will this recipe feed? I am having a dinner party for 8 adults and am wondering if 1 batch will be enough. About how long do the beans take in the crock pot? LOVE these beans! Thank you for sharing :) I have made them 4 times now and they are a hit. This is the 3rd "homemade refried beans"recipe I have tried, and THIS is the one I'm keeping!! :-) Simple and delicious...the simple spices given here actually end up tasting a lot better than the other recipes with the chili powder, cumin, etc. FYI: This recipe took me between 5-6 hours on HIGH heat in my crockpot. I double-blended it at the end--first with a hand blender then with my food processor since my little one has a problem with textures. Turned out smooth and delicious! By the time it was done I probably ended up with about 5 can-size worth of refried beans--all for under $2 in ingredients! (got my beans and bullion cubes at the dollar store) Might try it on low heat overnight next time, but otherwise wouldn't change a thing. Thanks so much for the great recipe! Are you using 5 small or large boullion cubes?? Thanks! Found you on Pinterest. Wow! What an incredible recipe. To say I never want to eat canned beans again would be a gross understatement! I currently have my second batch brewing. Like others, I was curious if these would freeze well, but I never got a chance to find out. The entire batch got gobbled quickly. I use Better Than Bouillon, which is more expensive than cheap stuff but is MSG-free and tastes wonderful. Thanks to the commenter who said she blended a can of chiles into the beans. I did the same and it was delish! Thanks for this recipe. I'll be making this for many years to come! I don't like the Ing. In the bullion cubes, can I just use Veg, or Chicken broth? Does the salt make the beans a chalky texture (prior to blending)? My past beans cooked with salt on the stove turned out this way. I've commented before.....but this is my third time making up a batch of these beans and I will probably never go to another recipe (or ever used canned beans again!) :-) I switched it up a little time--I used SMALL bullion cubes instead of the larger ones and I didn't add the butter at the end (cuz just to be honest I spaced out and forgot). The verdict=DELICIOUS! I almost like the flavor a little better with the small bullion cubes and I didnt even miss the flavor of the butter...I also cooked these overnight and that seems to work really well. These freeze and unthaw very well too--can't even tell it isn't a "fresh" batch. Love this recipe! About how long does it take to cook? Just to add to other commenters, I have frozen these and they freeze beautifully, don't dry out or anything. I just put them in sandwich baggies and make sure to squeeze all the air out, then freeze them flat. If you're in a rush, you can put the frozen baggie in a bowl of hot water to defrost and they can be ready in 15 minutes. I have also used these to make bean burritos for the freezer and they freeze well in the burritos too, and are much better than storebought burritos because these beans are creamier so the burritos don't get dry in the microwave like many do. They stay nice and moist. Thanks, Nikki! tried your refried beans recipe today, I am sold! I'll never go back! My kids both LOVED them and asked for seconds and thirds. I've tried so many different recipes, but this is the one we'll go back to! Thank you! After trying MANY recipes, I have to say that yours is the best and the easiest! Making some tonight with some home made taquitos! Can't wait for dinner. Thanks for all of your delicious recipes! I have never commented on anything, but i had to say this IS the best, have been cooking Mexican food for years and the old lard style Refried beans, this is easy and great. Thank you. Tried these last week, they are very good and very easy. They froze nicely and are great in burritos. Thank you for sharing your recipes! The only problem for me was that it took two pounds of dry beans to fill my 5-quart up two inches, so I don't know how you could achieve that with only three cups of beans... I wish the measurements were a little more detailed on the beans. My family loved the beans. They were so easy to make. Thank you for the recipe. I made these today for bean dip tomorrow! They are FABULOUS!!! I had a good bit of left over broth after making the beans. Even the broth is delicious! I am going to freeze it and eventually use it as a broth in something. Haven't decided yet if that will be soup or a gravy but it's way too good to put down the drain!!! These are exactly like the ones I love from our local Mexican restaurant - thank you so much! On a side note, I wish I had realized how much "2 inches (about 3 cups) of dry pinto beans into crock-pot" would make. For my large crock-pot, that was four pounds of dried beans, so needless to say, I'll be finding out how well they freeze. Thanks so much for the awesome recipe! I want to make these but unsure about freezing. Do you freeze a portion before you blend the beans or after? Do you think these could be canned after they are made? I made one batch & divided them up into freezer ziploc bags after blending them. Stored them flat in the freezer for about 2 months (I'm the only one who eats them in the house) and they tasted just as good as when I originally made them. This time I'm going to make a double batch and freeze again. I like freezing them because you can just break off a partial bag too instead of thawing out the entire bag. Can you freeze or can these? I am not sure. I have never tried it before. Sorry I can't be of more help. If you want authentic Refried Beans, melt some bacon drippings in a hot cast iron skillet then fry the beans til they absorb the drippings. That is why they are called refried. Can you use black beans for this? Hi! Have you tried this recipe with vegetable bullion? My daughter is a vegetarian so I try to accommodate her. Wondering if 5 bullion would be too much? Thank you! How much beans did you use for this meal? A whole bag? Thanks! Has anyone tried replacing the water and bullion cubes with chicken stock? Just curious how that would work. I just tried this with chicken stock but omitted the bullion cubes. I also replaced the garlic salt with four crushed garlic cloves and a tablespoon of sea salt....turned out amazingly! This is a keeper! I made this today. It was very good, but way too salty! Maybe you meant 1 tsp instead of 1 TBsp garlic salt. I'm not sure if I should be happy or mad - you've ruined canned beans for me and my family! Haha, okay I'm happy. Not only is this easy but they taste just like restaurants do. The only problem is you do have to plan ahead, no remembering 5 minutes before your tacos are ready to heat up the beans. Although I'd imagine you could probably freeze smaller portions and thaw/reheat right before serving. "About 3 cups" is 1 pound of beans. In a 6 at crockpot I did 2 lbs and did not have to add more water. Ready in about 5 hours. This recipe was such a huge success that I had to leave a comment and tell you how much we loved it. I see several people were curious about making this vegetarian. My husband is vegetarian so I replaced the chicken bouillon with vegetarian bouillon and added some vegetable stock with the water. It turned out amazing. I made these last night and they are the BEST. They tasted so good it wasn't until I re-read the recipe that I realized that I had not added the butter. Maybe I'll try that next time, but, I very pleased with how they taste as they are. Thanks so much for this recipe, I've been looking for a great one for awhile. Thanks to you, I found it. These are the best and so simple. Will make these again..... thanks for the recipe. Made these today. They are delicious. How long will they keep in the fridge? Can they be frozen? There's only my husband and I and as much as we like refried beans, we can only eat so much. Making this today for tonight's dinner. Love the fact it is in the crock pot while I get other stuff done. I added a smoked ham hock, garlic cloves and, salt pork. Mmmmm can't wait to dig in. Thanks! I don't cook much at all.... But tried this sooooo yummy and easy! Have made these several times. They are soooooo good! Thanks for sharing. My daughter is a vegetarian, have you ever tried with vegetable broth? Was it good? I ADORE this recipe! I have made it several times since I found it on Facebook and now my family can't get enough! It freezes well and it tastes A-mazing! . The only problem is there are never any leftovers! Thanks CiT! also, I've tried mashing in the onion one time and it was yummy. Great recipe just cook them in crock pot over night and finished them this morning.....Super yummy....Thank you for sharing! I am sorry, but the onion part confuses me...it says don't the skin later...doesn't that leave your beans with dry onion skin in it? Sorry, I had a typo put later and not layer. What you do is when you cut your onion in half, you remove and discard the outer skin layer. After you remove the skin layer, you set the onion half directly in the crock pot. No need to chop it up or anything. After they beens have cooked fully, I blend up the onion pieces with them so they are completely chopped up eventually when you mash the beans. Does this make sense? Please let me know if it doesn't so I can further clarify any questions. Hi, Chef. Thank you so much for this incredible recipe. Have you ever done this recipe with black beans? My family loves refried black beans way more than the pinto... thanks! What size crock pot do you use? I have a small and larger one. Was wondering if I could double the recipe in a 7qt pot. I have not tried with olive oil and don't know how it will turn out. I have left out the butter from the recipe completely though with no problems! Tastes just as great! It would be nice to know what size crockpot you are using. I have 3 different size crockpots and to add water until it is 3/4 full is going to make a huge difference in the end result depending on which crockpot I use. They sound delicious and I would love to make my own instead of using canned as we eat them quite a bit! I was skeptical about the time and effort beating out the convenience of store bought, but these beans are totally worth it. I made these yesterday and already have another batch going. My kids would probably eat an entire batch to themselves if I allowed it. Do you discard the onion after cooking or blend it up? I just tested this recipe today for a upcoming fiesta bday party. This will definitely be on the menu. It was so easy to make and very delicious. Thank you for sharing this wonderful recipe! Your recipe is pretty much like mine. I've never added butter though...only oil. I cook 284grams of beans for 8-9 hours with 6g salt 12g of better than bullion bullion, and 1/2 onion with a pinch of brown sugar (4g). When my beans are done I put them into my blender with all the juices and add water till it weighs 1000g. I turn the blender on and thru the top add the oil which is .175 times the amount of beans I'm blending and in this case it would mean 175g of oil added in a stream as I blend my beans. I sometimes use lard or skimp on the grease if I'm feeling healthy. Made these today and they are fabulous! I discarded the onion and added the can of green chilis. They were a side dish to a chili relleno casserole. Will use the leftovers as bean dip. Yum! Can these be made ahead and frozen? I've never tried this before but would like to take with us on vacation and not have to make them when I get there. These were AMAZING! Very flavorful. I just stood by the bowl and ate scoop after scoop, pleading with myself to stop so I would have enough for your taco casserole :) YUMMY!